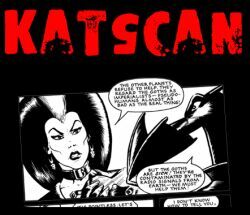 Rebellion have made a deal with Bristol-based electro-punk types Katscan to allow the band to use an image from a classic Nemesis the Warlock strip on their rather groovy t-shirts, as shown on this page. Massive 2000AD fans, Katscan's new album 'Feral Bios' even contains a track inspired by the Galaxy's Greatest Comic, entitled 'Be Pure, Be Vigilant, Behave! ', which you can grab on MP3 from the downloads section. "I think the vein of dark humour that runs through most of 2000AD's stuff keeps it from being too pompous or nerdy and that's always appealed," says Martin Diablo of Katscan. "We used the 'Be Pure' catchphrase from Nemesis The Warlock in the song for this same reason. The song is about 'Big Brother' type paranoia and conspiracy, which is quite a dark subject, but by throwing in Torquemada's catchphrase we avoid taking ourselves too seriously. Nemesis was always my fave story in 2000AD so it was a case of me 'having to' work in a reference to the characters sooner or later. And Grud on a greenie I did!" 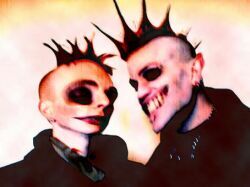 Katscan's music is a full-on tornado of dark electro-goth, mixing the high-camp sleaze of Specimen and Bauhaus with the industrial stomp of KMFDM, and tons of other stuff besides that, so if you like 'Be pure…' there are a load more tracks like that (and better) on 'Feral Bios'. Check out their website at www.katscan.co.uk for more info or to buy stuff.